Have you ever accidentally deleted an important file? An image that can't be recaptured, or a document you've worked long hours to prepare? In an over-extended and understaffed small non-profit, rushing to do seven different things at once, deleting the wrong file is an error that can happen all too easily. Fortunately, it doesn't have to be a crisis! When you delete a file through Windows Explorer, that file goes into the Recycling Bin (and similarly, Trash for Mac users) — unless you've changed the default settings to bypass the "safety net" of the bin. And until you empty the Recycling Bin is emptied, you can still go in and recover any of those files. 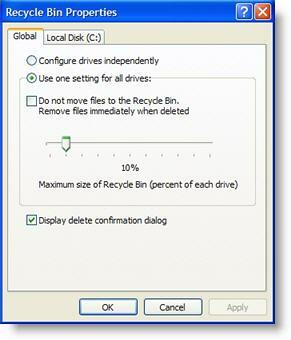 But what if, just as you click to empty the Recycling Bin, you realize that a vital file has been deleted? Or if you've deleted the file using Shift-Delete for permanent deletion, or through an application? You still have a good chance of getting that file back. On your computer, a deleted file is not completely gone until it's overwritten with new data. It's just been removed from easy access through your computer's file directory system. And a deleted file is not usually overwritten by new data right away, especially if there's plenty of free space on your hard drive. Somewhere between kicking yourself and calling your IT guy, then, there's a workable low-cost solution to lost files: data recovery software. A fair number of free or low-cost data recovery applications are available to help you find and undelete your lost files with a good chance of success, if you act quite promptly before the data is overwritten. Before I started using Sugar Sync to back up my critical files in real time — which we can explore another day, if you're interested — Recuva was my "undelete" lifesaver of choice. It's a free Windows application from, Piriform.com, makers of the well-regarded CC Cleaner. Recuva can help you find and recover deleted files even after you've emptied the Recycling Bin, help you get back photographs you've accidentally deleted from your mp3 player or camera media card, and will even tackle files that were lost in a system crash or as a result of a bug or virus. It's fairly straightforward to install, has decent online documentation as well as a user support forum, and runs in either Wizard or Advanced mode to suit your level of technical skill. Other options? Tech-savvy friends also use and recommend FreeUndelete from OfficeRecovery.com and ADRC Data Recovery Tools (both free, both for Windows), and the free open-source PhotoRec for Windows, Mac, Linux, and other platforms and media, including many common types of memory cards, mp3 players and cameras. If you've had success using another free file recovery program that you'd like to recommend, please let us know about it in the comments. We have had great success with Recuva in the past. Thank you for sharing. Nice collection of data. You have provided valuable information (at least for me). I have used Datarecoveryman.com to recover my server data.. its done. But your posts are nice to read.